Round 8/0 seed beads in color "Opaque Jet" (Color Code: 49). 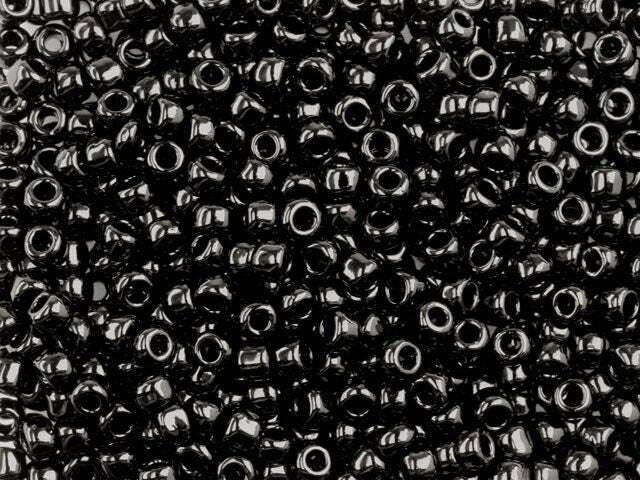 Toho's precision-sized round seed beads are manufactured with a slightly larger hole than other seed beads. Toho translates to "Eastern Treasure" in English. Japanese seed beads are favored for their high quality, precision crafting, and uniformity in size. There are approximately 38 beads per gram, depending on the color and finish of the bead. There are approximately 13 beads per linear inch. Measurements: 8/0 Size - Approximately 3mm in diameter, hole fits up to 18 gauge wire and stringing material (.040 inch).